Project obstacles and solutions: The Airport Authority was replacing a section of the air ramp that services the FedEx building at the Indianapolis International Airport. This was a four year ongoing project that requires the old concrete to be completely torn out and new concrete poured. This was scheduled a section at a time so the FedEx fleet can continue to work throughout the construction process. Shiel Sexton served as the general contractor for this project. The new pavement was designed to use a double-lift concrete method. The base concrete was poured using a lean, P306 Econocrete mix in lieu of a compacted aggregate base. This was then topped with a white pig cure and seal. The white pig serves as a bond breaker so the top layer can float on top of the base. This alleviates any movement in the sub-base as the top layer contracts and expands. 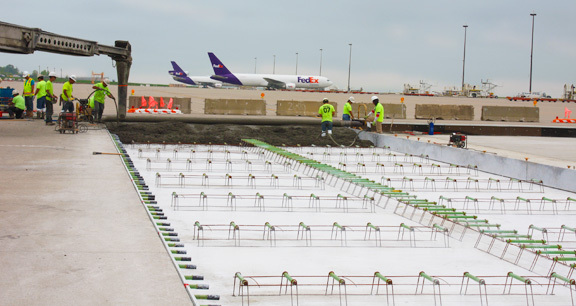 The top layer of concrete was poured with a P501 mix specified by the FAA for airport paving. Due to the tight turning radius of wheels on a heavy jet, this mix had stringent specs for tensile strength. IMI QC/QA designed a mix that met 700 flexural strength in 14 days. The top layer was poured at a depth of 18 inches with a two inch slump. The concrete was placed with a telebelt conveyor and leveled with a power screed. Special attention was given to the air entrainment of the concrete in this top layer. Two factors have a great impact on air entrainment: moving and dropping the wet concrete and low slump. IMI QC/QA monitored the air off the truck and at the point of placement to ensure the air met specs. IMI will supply a total of 20,000 yards of concrete for this project-12,000 in 2016. For more information on double-lift paving, tensile strength or air entrainment in low-slump concrete, contact the IMI sales representative for the plant nearest your location. Click here.